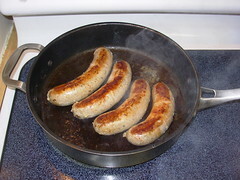 Sausages cooking. I simmered them in 1/4 inch of water for about 15 min, then drained the pan and let them get a little brown. 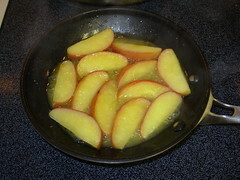 Apples frying. Just apples and butter, nothin' else. 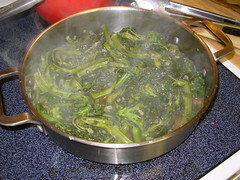 Broccoli rabe before and after wilting down. 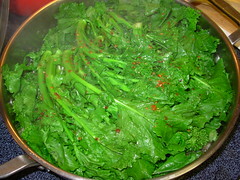 I minced a shallot and sauteed it in olive oil until it just barely started to turn brown, then added a bunch of broccoli rabe, about 1/2 cup chicken stock, a pinch of salt, and a pinch of red pepper flakes. Covered it and let it simmer for 20 min or so. Dinner is served! I actually only ate one of the sausages. We had some mustard with it too. That looks like good food. What do the apples taste like? Another great idea for a dinner. 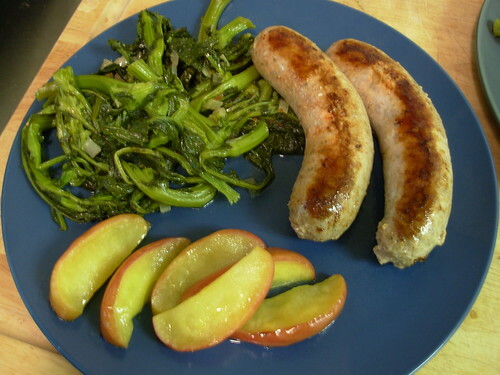 We did it with asparagus sauteed in EVOO/garlic and put a little apple pie spice on the apples. Outstanding!